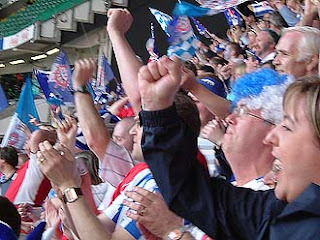 I cannot believe that it is 10 years since we made the trip down to Cardiff for the playoff final with Sheffield Wednesday. As the lad said when he threw out the clock from his bedroom window: ‘My, how time flies’. So much has happened since then, and like many others I have experienced births, deaths and marriages, and on a personal level, become a Grandad as well as taking early retirement. Some might say I am older and much wiser. Others might disagree as I still have a season ticket for Hartlepool United. It is easy to support the big clubs. Sunderland is only 20 miles away and if I want to see the Mags they are only a further 15 miles up the road. However they are not my clubs and not my towns. I boil with rage when I see someone walking around my town wearing another team’s colours; even more so if the shirt in question is of the Premier League variety. There are however some exceptions. I did once ask a lad why he was wearing a Donny shirt (my favourite Yorkshire club). He told me he was holidaying in Hartlepool! Pools have played a big part in my life and I would like to think that I have played a ‘bit’ part in theirs. I can recall in the 70s when the club was so hard up that at half time the ballboys would walk around the ground with a blanket for the fans to throw their loose change into, to contribute to the players’ wages. Many’s the time I would throw in my bus fare and walk the three miles back home, more often than not with a force nine blowing off the North Sea. On another occasion, when I found that I was due to have a surgical procedure on my back on the same day as Pools' away fixture with our local rivals Darlington, I rang up the hospital to cancel the operation. Even though we nicked a point, watching that match was like having the operation only without the anaesthetic. When the NHS finally got around to performing my cancelled operation some 18 months later I was told to recuperate at home, which meant that I would miss three vital home games which would determine our league/financial survival. How did muggins here support his club during that time when both myself and my football team were literally on our backs? I sent a letter to the chairman along with my gate money for the three matches that I would miss. He in turn wrote back to me saying that he read my letter out to the team before kick off, as well as telling them of my financial contribution, and Burnley were dispatched two goals to nil (my part in Burnley’s downfall). It would not be unfair to say the word ‘successful’ and Hartlepool United do not sit comfortably together in the same sentence. We hold the record number, never to be beaten, of 14 re-elections to the Football League. When I last checked we still hold a record of going 1,227 minutes without scoring a goal. Even the goal that broke the drought was a penalty! 1990/91 – finished third, one point behind the champions, and our deadly rivals, Darlington. 2002/03 – finished runners-up by one point to Rushden and Diamonds, despite earlier having a 12-point advantage over them. Our last game of that season was at Rushden, a match that would determine who would be Champions. With minutes remaining, Pools had a legitimate goal ruled out which would have given us the title. Their keeper Billy Turley missed a cross, Pools scored, and he went down rolling all over the place as if in some sort of drug-crazed convulsion, and the ref disallowed the goal. Turley got up laughing his head off. A few seasons later he was banned from football for taking cocaine. Not long afterwards his club folded. Here endeth the lesson not to mess with Hartlepool United. What goes around comes around! A few weeks earlier in this same campaign, despite a 4-0 thrashing at Scunny, we had gained promotion as other results went our way. It must be the first time in history a team who had been promoted got booed off the pitch. 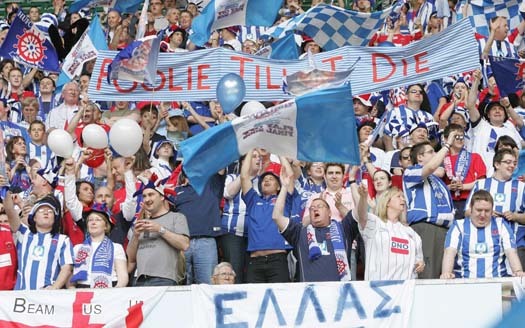 2006/07 – runners-up again, this time finishing one point behind Walsall. Once again, we threw the title away. We kind of gate-crashed the play-offs in 1999/00 as uninvited guests. In truth we were not really ready or equipped for them let alone gaining promotion. This was compounded when derby rivals Darlo beat us to reach the final. The following season, Blackpool’s Brett Ormerod carried out his one man demolition of Pools. This was made the more galling as we had done the double over them during the course of the season. Even more galling was that Pools should have gone up in third spot due to Chesterfield making improper payments to players as well as other financial irregularities. The Spireites got off very lightly when the League very conveniently docked only 9 points, keeping Pools out of an automatic promotion spot. Chesterfield are forever known in Poolie circles as ‘Cheater-field’. Cheltenham (2001/02) went to penalties. Ritchie Humphreys’ penalty hit the bar, bounced off the goalkeeper's back then rolled along the line, hit the post and went out, as indeed did Hartlepool. Always the bridesmaid. Bristol City, 2004 – last few minutes, winning 1-0. ‘Pools lost two experienced central defenders to injury, Micky Barron was carried off unconscious as City took advantage, nicking two goals in quick succession. However that was about to change when we drew Tranmere in the playoff semi in 2005. We comfortably beat them 2-0 at the Vic but we were unsure if it was enough to carry us through at their place. As it turned out, at Prenton Park they absolutely battered us for the best part of 90 minutes. At times it was like the Alamo, and our ‘keeper, Dimi, played an absolute blinder and kept us in with a shout. The game went to penalties and it was fitting that, after Cheltenham, Richie Humphreys’ left foot spot-kick sent us to Cardiff and the Poolies into delirium. Pools sold 17,500 tickets which was less than half of what Wednesday sold but that accounted for nearly 20% of the population of Hartlepool. 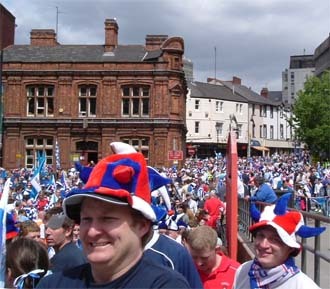 Those who did not make the journey to Cardiff said on the day of the final that Hartlepool resembled a ghost town, with nobody about, and shops shutting early as they were devoid of people. Someone else remarked that it put him in mind of the day of Lady Di’s funeral when everyone was at home and off the streets watching the proceedings on the TV. One of the advantages to being a one-club town resulted in the following joke doing the rounds, that the whole town of Hartlepool and half the city of Sheffield were all rooting for ‘Pools. We travelled down the day before the final and it seemed an age getting to Cardiff. I was thinking that it was going to be one hell of a long drive back if we get beat. After checking into our hotel, which was about eight miles from Cardiff, we then headed into the city to get the lay of the land and more importantly a bite to eat. Back to the hotel and we shared a few pints and a good laugh with some Preston and West Ham fans whose finals also took place that weekend. Quite a few ‘Poolies billeted themselves over the water in Bristol, however some friends of my son decided they would break the journey by staying overnight …in Norwich! They only just made the kick-off with seconds to spare. It always makes me giggle whenever I see the BBC weather forecast map on the TV and see how far away these two cities are from each other. On the big day we decided to get into Cardiff as early as possible. Leaving our car at the excellent park and ride facilities we got dropped right in the centre of town and even at ten in the morning the place was a sea of blue and white, with many of them quaffing pints, even at that hour. We opted to go on an open-top bus tour of the City, and it has to be said, Cardiff was not the ‘doss-hole’ that I had expected it to be. It was obvious that vast amounts of money had been thrown at the place, particularly the marina area of the city. It was nothing like the images I had previously envisaged of Shirley Bassey busking on the docklands of Tiger Bay. Our bus took us past the hotel that the Pools players were staying in. Outside, on the forecourt, we could clearly see Chris Westwood and we gave him a shout and he waved back at us. Little did we know that he would later be waving the Millennium Stadium goodbye eight minutes from normal time… Little did we also know that Westy would also be waving goodbye to Hartlepool United. His girlfriend, unable to settle in the North East, wanted him to move to the Midlands (women!). He subsequently signed for Walsall. On his return to the ‘Vic with the Saddlers he got such a great reception from the Poolie faithful that manager Martin Scott complained about it in the local press. Every time Westwood touched the ball the home fans cheered. Each time he came up for a corner they chanted ‘Westy Westy’. You could not believe the racket the Pools fans made when he scored the ‘inevitable for it is written’ goal. Needless to say, he did not celebrate. I asked my wife ahead of penning this what was her main memory of Cardiff. She said that it was like being in Hartlepool shopping centre on a Saturday afternoon as she knew every second person she bumped in to - many of whom had never even seen Pools on a Saturday afternoon in Hartlepool, let alone a Saturday afternoon in Cardiff. The city centre was a sea of blue and white stripes, you could not distinguish who was friend or who was foe. I am sure this created a few problems for the authorities in trying to segregate both sets of fans. Unable to get into the pubs in the Hartlepool quarter we had a bit of a wander and without knowing it ended up in the Wednesday part of town. Very civilised it was too, got served in no time at all in the pubs in this area. They mustn’t have the same drinking culture in Sheffield as we do up north. We said that we would stay for one drink and then move on but soon we were having the craic with a great bunch of lads and lasses from The Steel City. After a few pints with them I said that we would take our leave and head back to ‘our end’ of town to seek out a few mates but they insisted that we stay with them, so we did. Who said that Yorkshire folk are dour? Before finally taking our leave of our new-found friends and wishing each other ‘all the best’, one of their lads predicted a 4-0 win to the Owls. I went 2-1 to Pools. To many outsiders, Pools might have been viewed as the underdogs but we Poolies did not think that was the case. Yes, Wednesday were the bigger club, but in terms of what happens on the pitch there was not a lot to choose between the two teams. Wednesday finished one point better off than Pools in the final league placings. But a few weeks earlier Pools tore the Owls to shreds at the Vic with an Adam Boyd hat trick. 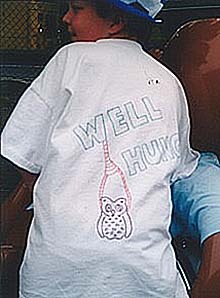 My 12 year old son was mad keen to get into the stadium as soon as it opened up for business, so along with a four foot blow-up monkey that he carried about with him all day, partially obscuring his tee-shirt with a picture of an Owl with a rope around his neck and big block lettering saying ‘WELL HUNG’, off we set. As kick-off approached the atmosphere in the Pools end stepped up to a different level when we began singing Two Little Boys. I have to admit to telling my son that I had to wipe some dust out of my eye when he asked if I was crying. The first half from Pools' point of view was a bit flat. Martin Scott surprised many by his team selection, leaving out John Daly and Eifion Williams. The Owls' goal just before half time was the catalyst to force Scott’s hand and Pools stepped up a gear, and grabbed two quick goals from Williams and Daly who had come off the bench. The more the match progressed the more it looked as if there was only going to be one winner. Wednesday did not offer much and their fans despite their numbers had gone very quiet. Then, the turning point in the game came when I said to my son ‘it looks as if we have done it’. At that precise moment that referee, sorry, that clown Phil ‘Bosseyed’ Crossley awarded the most dubious of penalties; and to rub salt into the wound, send Chrissie Westwood off in the process. I dug the video of the match out only yesterday and the more you look at the penalty the worse it gets, as the Wednesday player was falling and conned the ref, who was a mile off the pace, and is not even seen on the screen. Basically the ref was conned, and today the Wednesday player in question would probably have been cautioned for simulation..
Wednesday only just managed to convert the penalty but none the less convert it they did and that was effectively game over. Our lads had given their all including losing three first-teamers to injury during the course of the game and were now down to ten men with another 30 minutes to play in the heat. The records show that Pools lost 4-2 but that does not tell the full story. Rumours of the match officials seen up late the night before (I think that is a euphemism for being on the lash). On the day there was little to choose between the two sides overall. The Owls had the better exchanges in the first half and thereafter Pools were in control of the proceedings until they went down to ten men. Three members of the team who played in the final came off injured. Captain Micky Barron, Joel Porter (14 goals in that season) and wide man Thomas Butler. Another factor in why we lost was the decision and timing of Hartlepool’s owners IOR to dismiss Neale Cooper just a few weeks earlier. This was crass bad management, the highest level of incompetence. This was Neale Cooper’s team and he knew what made it tick. This decision had far reaching effects that ultimately led to the team's relegation the following season. as well as Martin Scott’s belated but welcome dismissal as manager. Cooper, the fans' favourite, was sacked just before the last league game of the season against Bournemouth. Although rumour and counter-rumour abound as to why Cooper lost his job, ten years on, the truth is yet to come out. The timing of Cooper’s sacking would not have given Martin Scott (Cooper’s former assistant) time to put his own ideas into practice. He seemed to be more defensively minded than Cooper as was displayed in the away semi final at Tranmere and the first half at Cardiff. As for Sheffield Wednesday on that day - a hard-working, no-nonsense team who played nice football in part, but their heads dropped when Pools went two up. At one point they seemed to be expecting Pools to get a third until ‘Cross Eyes’ Crossley intervened. The Owls had obviously done their homework on Adam Boyd, Pools' leading goal scorer with 28 goals, and man-marked him pretty much out of the the game, not to mention cutting off much of his line of supply. I can only recall Boydie having one shot at goal all game. To quote from the official History of Hartlepool United Pools weren’t beaten by the Wednesday team that day, ‘they just lost’, which in retrospect is a fair comment. My own theory as to why we did not win – we lost the toss and had to wear our red away shirt, nice though it was. Recently there was a reunion of the squad, organised by the fans to mark the tenth anniversary of Cardiff. With the exception of Jon Daly, who was in the Rangers squad for a match the following day, pretty much the whole squad was in attendance. It has been put on record on many occasions that this group of players were a very close knit group, who really got on with each other. Prick one and they all bled. If they did have a fault, they were too nice, both on and off the pitch. It spoke volumes that centre forward Joel Porter flew in from Australia on the Thursday to attend this event, and jetted back off home again on the following Monday! The whole squad sat on the top table. Sat in the middle of his players was the manager the man who got ‘Pools to Cardiff. No it was not Martin Scott, but Neale Cooper. Martin Scott did not attend, perhaps because of Cooper’s presence, or perhaps he was not invited. On our way back to the hotel we stopped off at a curry house in the Valleys and had a very enjoyable, though very quiet and subdued meal. Half way through, four Owls fans came in and sat at another table. As we were leaving, passing their table we wished them luck and a safe journey home. One of them without raising his head and looking at us told us that we were really unlucky. Respect. The whole Cardiff experience, despite the result, was really enjoyable. The organisation itself was excellent including Park and Ride. The people of Cardiff we spoke to were very friendly as were the police and stewards at the stadium. Unlike Wembley, everything was bang in the city centre, including the stadium, not to mention the many pubs which did not charge an arm and a leg for a pint. Moving the play-offs and various finals back to Wembley must have cost the city of Cardiff millions in lost revenue. Ten years have gone. Ten years ago Pools played Tranmere and Cheltenham in the play-offs and this season all three of us were in a battle for league survival. Fortunately thanks to Ronnie Moore we beat the drop despite at one stage being 12 points adrift. Maybe, just maybe, perhaps Pools are not always The Bridesmaid. For those not in the know on Hartlepool’s relationship with simians and ropes, Google 'Hartlepool monkey hanging'. And for the record, we still have the blow up monkey in our garage, awaiting his next big day out! This article was originally written as a Poolie's view of the day at Cardiff, for the Sheffield Wednesday fans' website Owls Alive (www.owlsalive.com), who did a special feature on it for the 10th anniversary. We thank them (and of course Billy's Contract) for allowing us to use it.